Do you dine al-fresco or al-desko when lunchtime rolls around? Employees may be missing a vital opportunity to reduce stress levels, improve their mental health, increase job satisfaction and productivity by taking a lunch break. In fact, almost one third of UK workers do not take proper lunch breaks. How can you cut through the excuses and lead more fulfilling days at work? Three years ago, PUSH Coach and Author Laura Archer realised that her life was restricted to the weekend. Full days at the office and a high workload saw her stressed out and lacking control: something had to change. Laura decided to start taking her lunch breaks, and use them to achieve personal projects, learn new skills and meet new people. It wasn’t long until she had learnt to play chess, read a book, cycled, dated, swam and grasped the Italian language, all on her lunch breaks. Laura chronicled her escapades in ‘Gone for Lunch: 52 things to do on your lunch break‘. The solution wasn’t drastic, but it was life changing. “I was blown over by the effect that these simple breaks away from my desk had on the rest of my day, my week, my month and my life. My job satisfaction, mental health and even diet improved dramatically” said Laura, who is now an advocate for wellbeing at work. Laura felt in control of her life again and resorted less to coffee for energy and alcohol to relax. As part of Stress Awareness Month, Havas Media wanted to launch an initiative that their employees could action and see a benefit from when it came to their stress levels at work. Laura’s talk ‘The Life Changing Magic Of Taking A Lunch Break’ was a perfect partnership to inspire the Havas Media team to step away from their desks at lunch time and seek out joyful activities that life normally gets in the way of. “Stress is so common, especially in the work place. Half the battle is encouraging people to talk openly about stress and how it’s affecting them. It’s so important that we find and share simple, realistic ways of combating stress together.” said Charley Walsh, the Learning & Development Partner at Havas Media. Forty-nine percent of workplace absences in the UK are due to stress, and burnout is more common than ever. Since 2017, online searches for ‘stress’ and ‘burnout’ have increased seven-fold – it’s clear that employees are seeking answers. “Our brains are configured to work out a certain number of decisions per day” said Laura, when explaining that the 8-hour work day was built for production lines 216 years ago during the industrial revolution, and many deem it as an outdated way of working. A study in 2016 showed that most people complete just three hours of productive work on average in an 8-hour work day, which makes a strong case for taking a lunch break. What then, is the best way to spend your lunch break? Laura recommends stimulating the opposite side of the brain to your line of work. For example, if your work is highly methodical and uses the logical side of the brain, try firing up the right side of the brain on your lunch break through sketching or photography – a creative outlet of your choosing. Laura acknowledges that it can be hard to take even a 20-minute break. Pressure from colleagues, workload and deadlines all play a part in keeping employees at their desks. But a growing body of research suggests that taking a break is vital for mental health and overall brain health. “Breaks improve our ability to be productive, come up with ideas and be better workers.” says Laura. 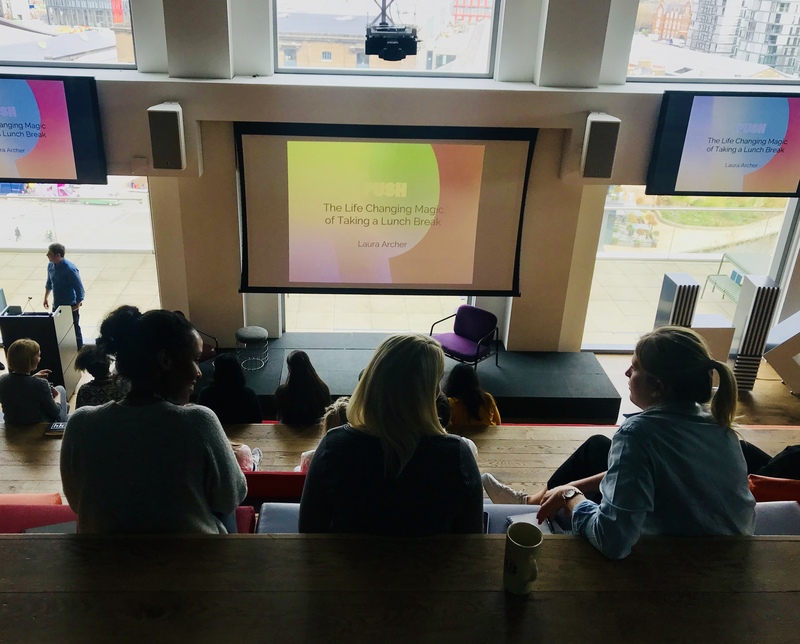 As part of ‘The Life Changing Magic Of Taking A Lunch Break’ talk, teams at Havas Media were challenged to reclaim their lunch break for the month of April. From going for a walk to window shopping – anything goes. “The person or team who takes the best #HavasGonetoLunch picture, showcasing what they’ve got up to on their lunch break will win a free lunch. Our Leaders and Managers are on board and will actively be encouraging their team.” Charley Walsh told PUSH who developed the challenge with the sole aim of reducing stress levels amongst the Havas Media teams. What will you do with your lunch break? Some ideas from the Havas Media team included: life drawing, planning a redecoration, visiting a museum, and getting fitter – the sky’s the limit. At PUSH, we take pride in thinking outside the box for our clients and our shared mission to improve the wellbeing of their employees. If you’d like to speak with us about developing an initiative to reduce the stress levels of your team, get in touch – we’d love to work with you.